Get ready to get awesome! 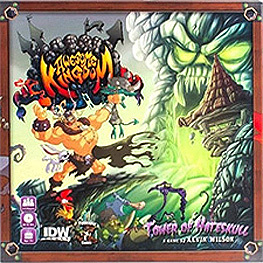 In Awesome Kingdom by Kevin Wilson (Descent, Arkham Horror, CHEW) you'll take charge of one of the "Awesome Ocho", a band of heroes on a dungeon crawl searching for untold riches. This tongue-in-cheek dungeon crawler delivers three rounds of highly-strategic laughter in an over-the-top setting of awesome proportions! The home of the foulest couple in our fair land, The Tower of Hateskull is also the last known resting place of the Stick of 6 Parts an artefact so ridiculously overpowered that the gods broke it up and hid it after creating it.